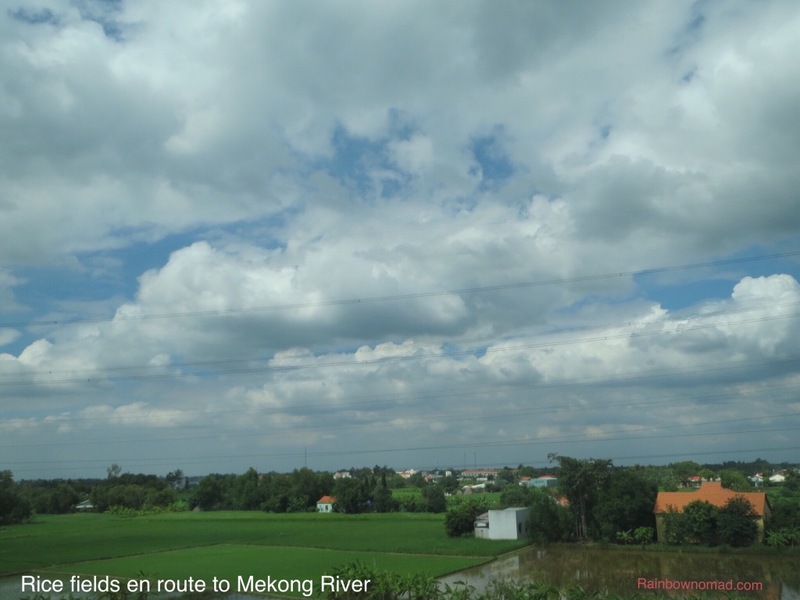 Meandering along the Mekong with APT from Saigon to Phnom Penh means sailing up the Mekong delta to the junction of the Upper and Lower Mekong, the Tongle Sap and Bassam rivers which all converge in Phnom Penh. 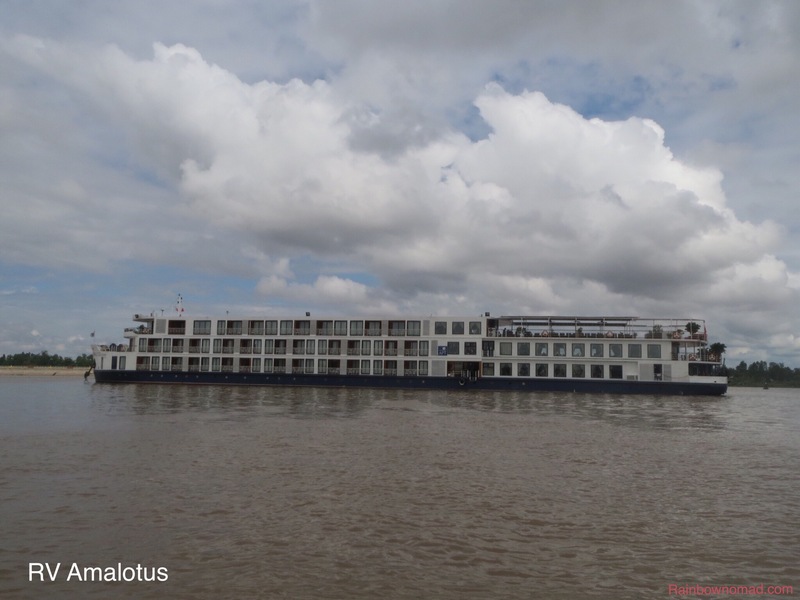 We boarded APT’s river cruiser, the RVAMALOTUS at My Tho, having driven from Saigon, through miles of rice paddies and small industrial towns. The RV Amalotus has 3 decks, 2 dining rooms, a lounge, a wellness centre and a gym. We are 96 mainly Australian passengers with a sprinkling of English, Dutch and New Zealanders. Our accommodation is sumptuous in natural wood, stained in the dark Vietnamese style and we luxuriate in the idea of unpacking for 8 days. We are provided with internet password (intermittent), portable audio guide and daily updates of the trip and international news (if we wanted it). The staff and crew are impeccably trained, our experience of our only other APT cruise. 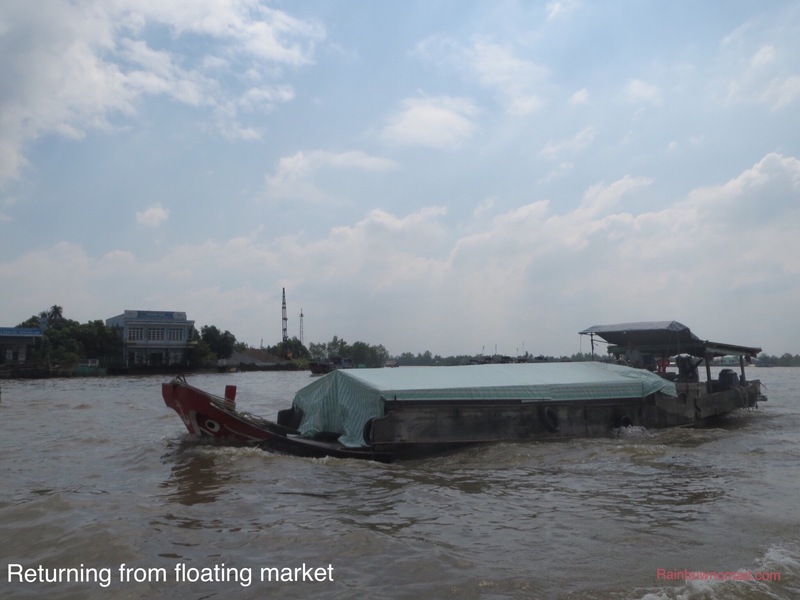 We set off for our first stop at the floating markets at Cai Be. Leaving too late to see the trading action, we did see laden boats returning from the market and stepped ashore to observe a local factory producing popped rice and noodle snacks and rice paper. 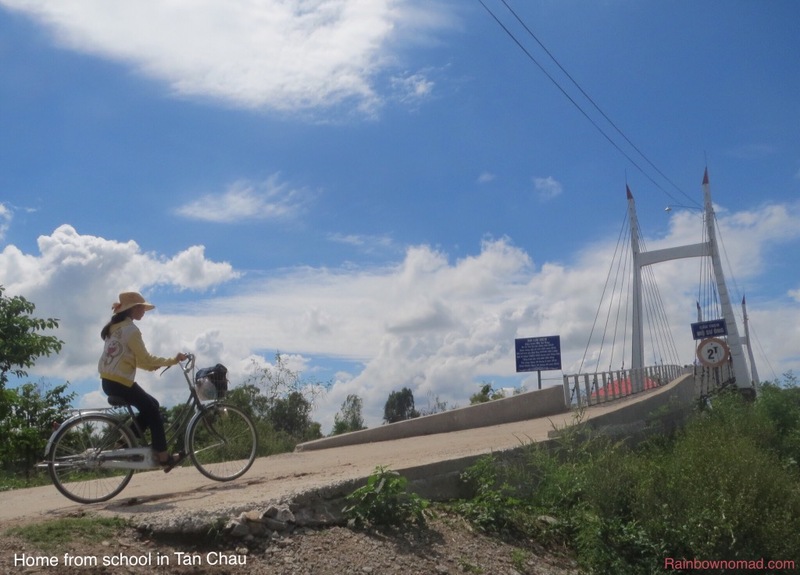 Our journey continues on to the town of Sa Dec, made famous by the love story between novelist Marguerite Duras and her French educated Chinese lover, Huynh Thuy Le. Unfortunately their love did not result in a formal union and Marguerite returned to France, while Huynh was married to a Chinese woman his family chose. The story forms the basis of Duras’ novel, The Lover, which was also made into a film. Inside the house, which is now a museum and where we are offered ginger tea, there are photos of this story and the film stars. 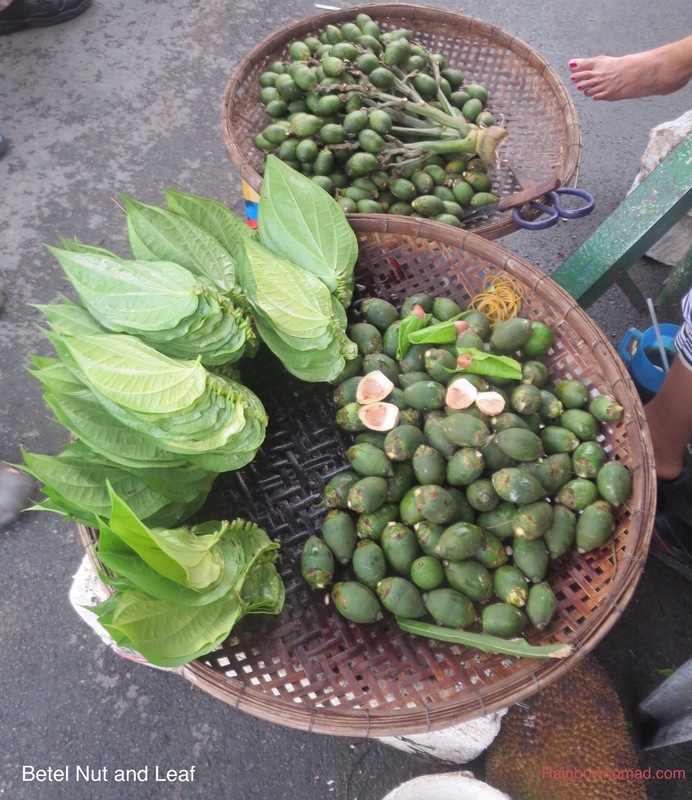 We wander on through the market where we can buy betel nut and leaf. 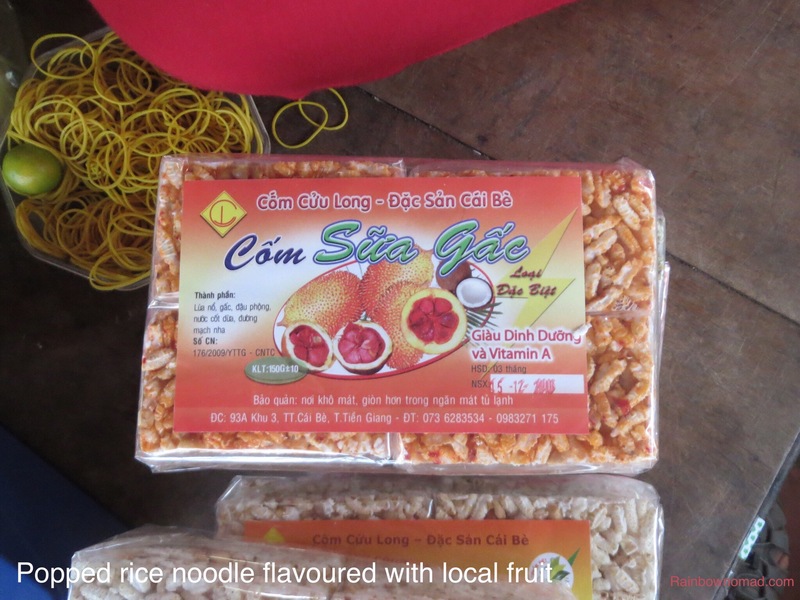 The nut is notorious, when chewed with lime, for producing a high and turning gums bright red, whereas the leaf is eaten and formed part of a type of Vietnamese vine leaf dish we made. 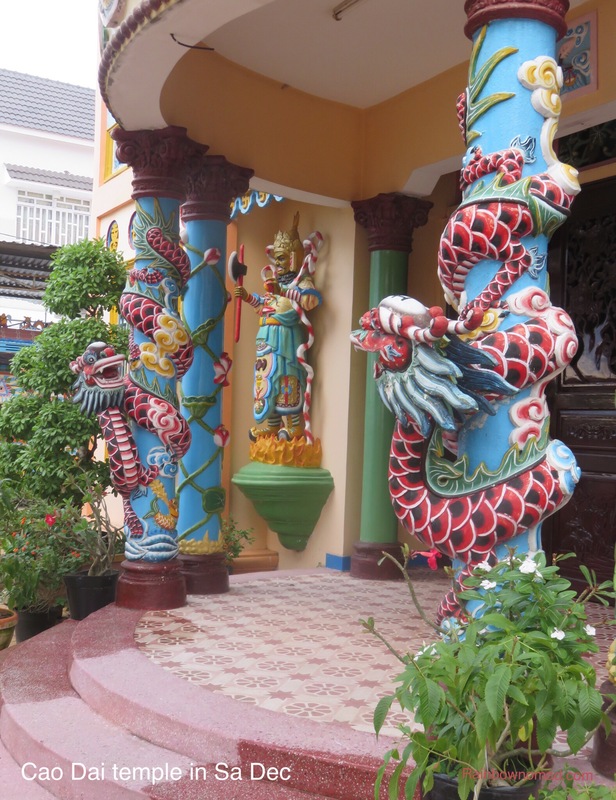 Here we also visit a Cao Dai temple. 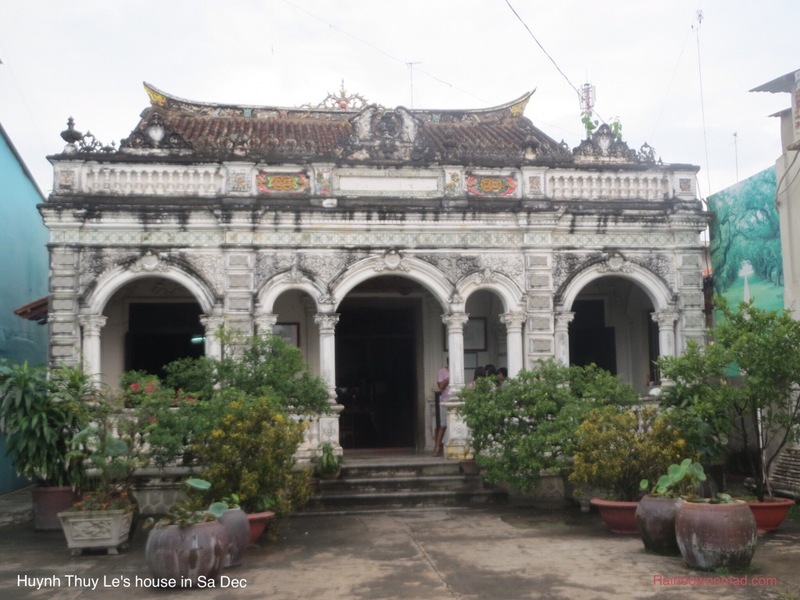 About 5% of Viêt Nam’s population practice Cao Dai, which is an Eastern religion incorporating all other religions, including Buddhism, Hinduism, Taoism, Confucianism, Christianity and Islam, possibly even Judaism. The temples which promote god, humanity, love and justice, are extremely colourful and promote Sun Yat Sen, Victor Hugo and 2 Vietnamese poets, a wonderful conglomeration of things worth valuing. On up the river, we stop at Tan Chau, where we can just see the border with Cambodia. 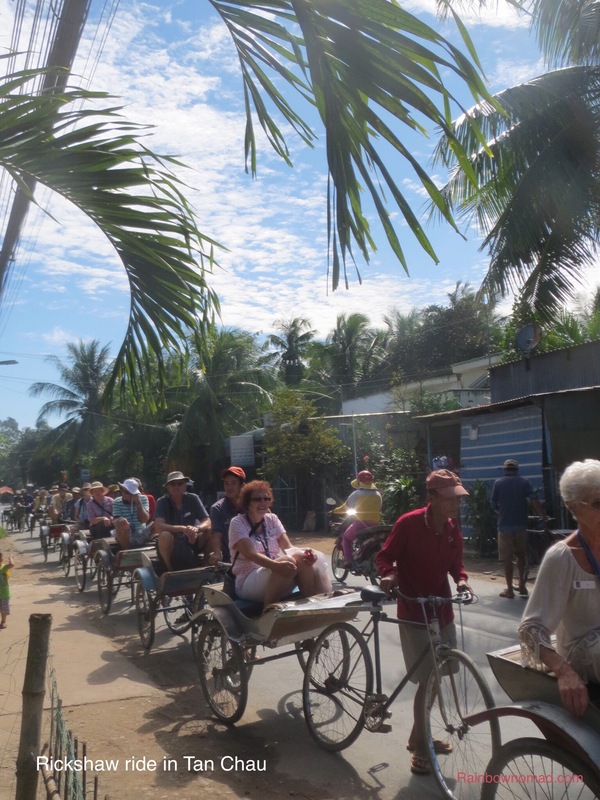 Our journey is via individual rickshaw to a silk factory. 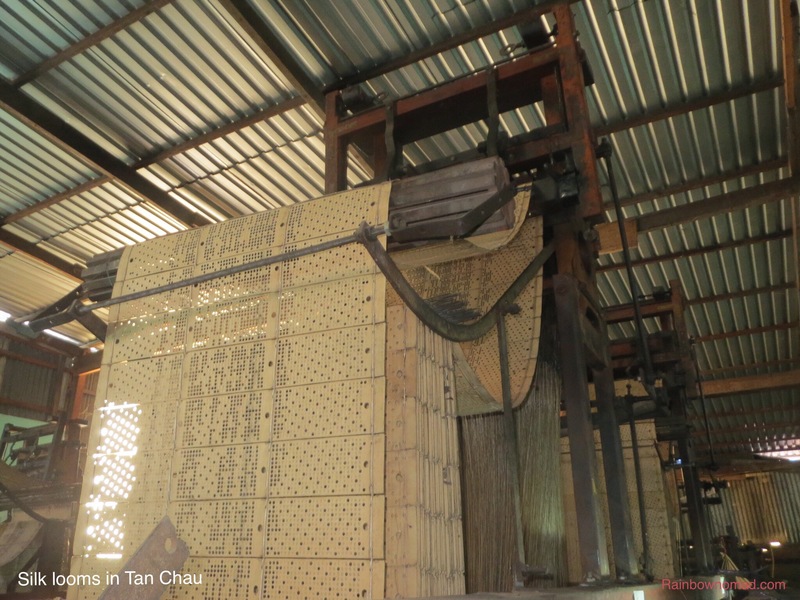 We see 5 metre high looms with paper patterns like pianola rolls, stretched over the frames. 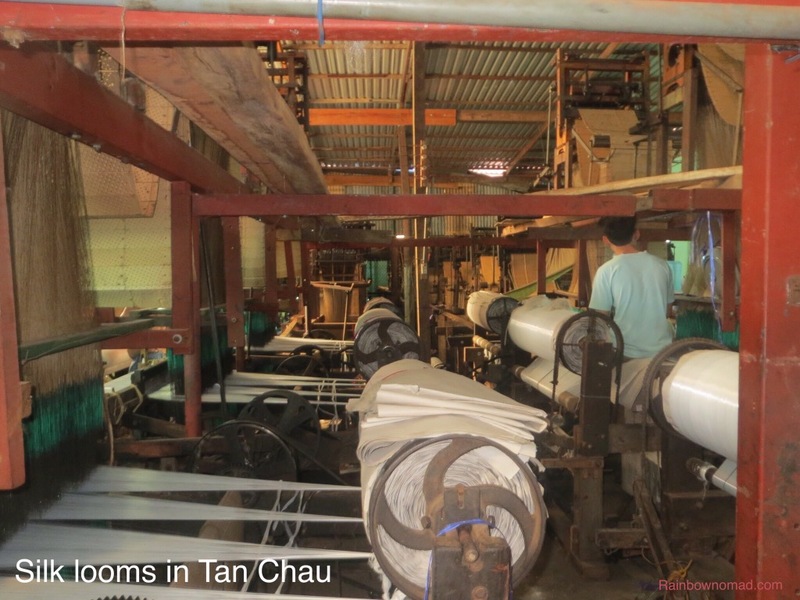 As we move into the factory, about 50 looms are loudly in action, producing jacquard silk cloth and tended by barefooted workers, with no ear protection. Some were smoking. Different rules of occupational health and safety obviously operate here. The cloth is hand dyed with a vegetable dye and was beautifully silky and soft. The outlet shop did excellent business. 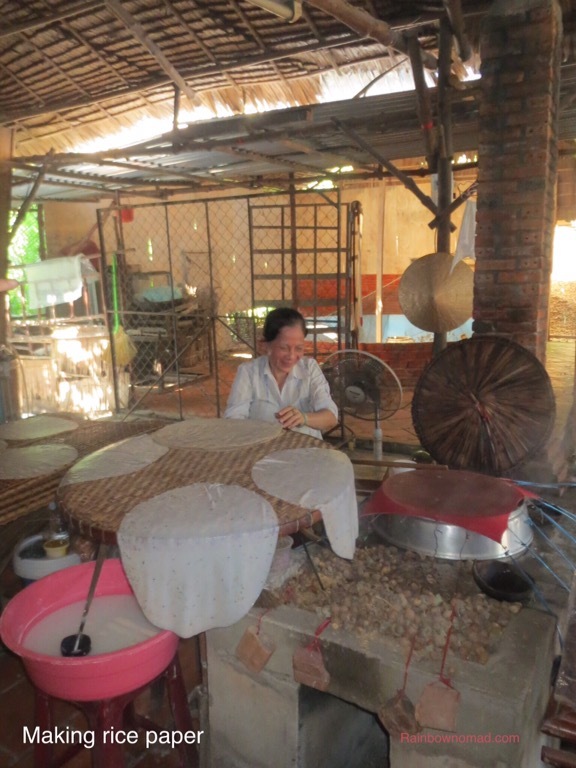 Tan Chau is only one of two silk producing areas in Viêt Nam, the other being Haiphong in the north. 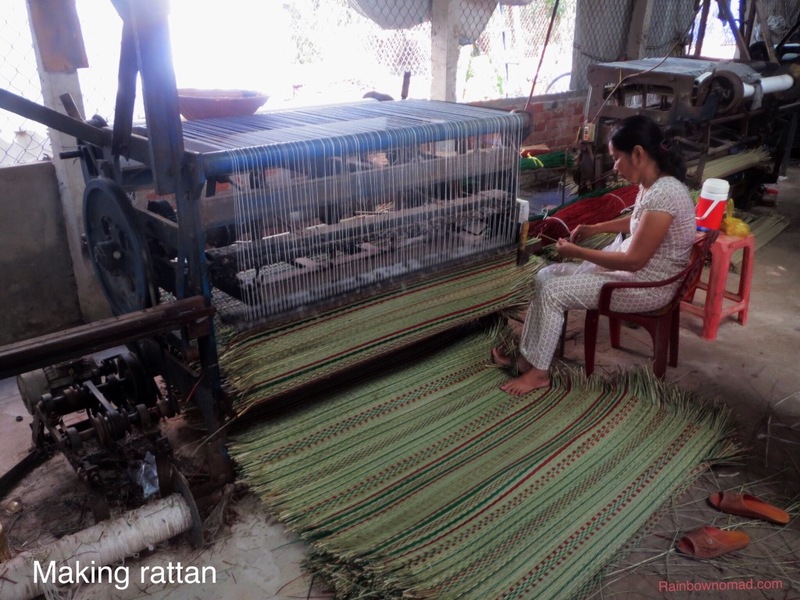 Settling back into our rickshaws, our next stop is a rattan mat factory. These are all cottage industries and the women working here make about $20 for a 4 hour shift, which might produce 4 metres of mat. The looms are set up so they can be operated by foot, feeding the straw between cotton thread. One worker was watching a video on her phone as she worked. 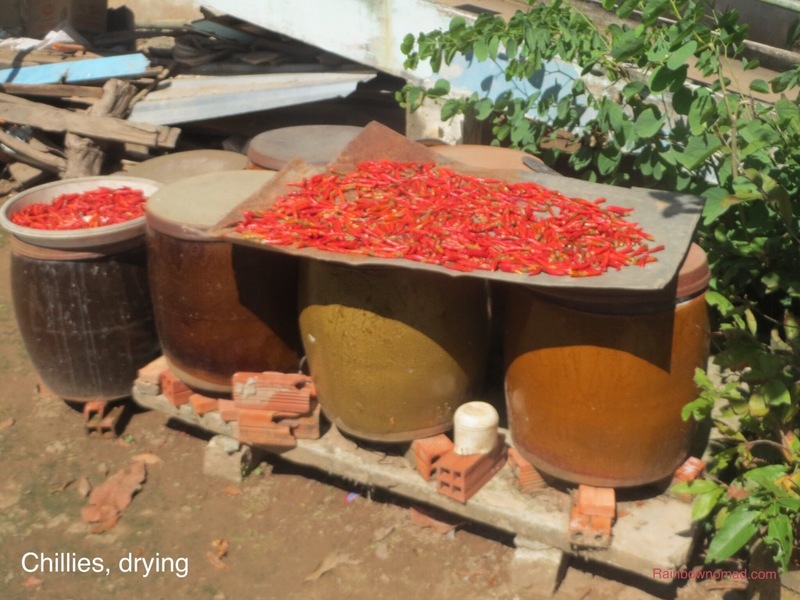 We walk back to the boat through a village growing fields of chillies. It is lunch time and the morning 4 hour shift of school children are returning home. After a night cruising upstream, we come to the junction of the four rivers. We are now in Cambodia – or Cambodge as the French named it or Kampuchea as the locals say. We sail into Phnom Penh as the sun rises on the horizon, illuminating the tops of pagodas. In the distance we can hear the chant of monks. We are in another world.